So Easter is almost upon us again - there'll be eggs all over the house, kids running riot on a sugar rush. Last year it took us months to get through the chocolate backlog of eggs that Mister A acquired! Don't get me wrong, I do love a good Easter egg but they're for the kids really - I shouldn't indulge but I do. I always feel guilty for eating stealing an egg from Mister A but no one ever treats me to an egg anymore... until now. 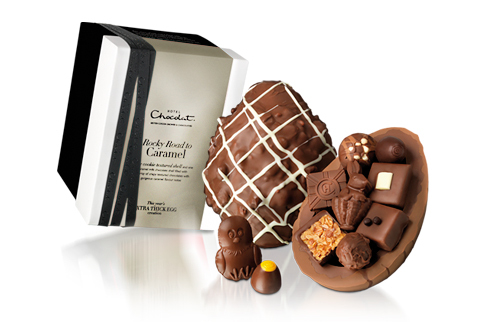 Last week I was sent THE most AMAZING 'grown up' Easter Egg I have ever seen - the Rocky Road Caramel Egg from Hotel Chocolat. The egg comes in a luxurious box with a ribbon around the outside. I carefully slid the egg out of the box to reveal 2 individually wrapped halves. Each half was filled with a yummy variety of individual chocolates (10 in total) that come with their own menu. One half has a thick cookie-textured milk shell and the other is layered in smooth caramel chocolate. I can not even begin to describe the deliciousness of this egg - I tried to just eat little bits at a time 'cause chocolates good in moderation - right? Wrong - chocolate is even better when you eat it all in one go NOM NOM NOM. My favorite was the cookie side of the shell, I loved the crumbly cookie bits encased in the thick milk chocolate. Chocolate Heaven. I did share a little bit with Chris, but he enjoyed it far too much for me to leave it unattended so I hid the egg and ate the rest of it myself! So there you have it, it's amazing, I devoured it in a day. If you've got someone special in your life and you want them to be massively in love with you over the Easter period then look no further than the Hotel Chocolat Easter Gifts page. You'll be in the good books 'til Christmas - I guarantee it!